Blackjack Surrender is an exciting variant of 21 from leading software developer, Playtech, allowing you to surrender a poor blackjack hand for the chance to retain half your wager. 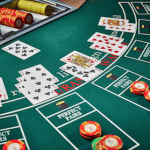 Find out more about this blackjack game and where to play Blackjack Surrender for real money bets. Note: As of September 2017, online casinos are banned from offering their services to Australian players. The information in this article is directed at international readers only – we do not endorse any casinos for Australian readers. Playtech’s Blackjack Surrender is a multi-hand game which allows you to play up to five hands at once. Minimum bets start from just $0.50, with maximum bets capped at $50.00 per hand. It also offers the unique option of changing the colour of the betting table to suit your personal tastes. The theoretical RTP when using optimal strategy is 99.66%. Like all classic versions of blackjack, the aim of Blackjack Surrender is to get a hand that’s closer to 21 than the dealers, without exceeding 21 (which is known as going “bust”). Natural blackjack’s that consist of a ten-value card and an ace result in an automatic win, while all ties with the dealer of 17 and up result in a push. The major difference in Blackjack Surrender is if, after the dealer has checked for blackjack, you don’t think your hand is strong enough to beat theirs, you can choose to surrender your hand – essentially bowing out of the game. If you surrender, you get half of your wager back, so the game is not a total loss. Blackjack Surrender is available at Casino.com for free demo play or real money bets. Once you’ve loaded the game, click on the chips to select the value of your bet. You can play up to five hands at once – just place the betting chips on the corresponding betting sections. Once you’ve placed your bets, hit the deal button to receive your cards. You’ll then have the option to hit, stand, double or surrender. If you’ve chosen to stay in the game, the dealer will now reveal their face-down cards and your hand is compared to theirs to determine the winner. All wins are automatically credited to your account and you now have the option to start a new game or re-bet to place the same wager as the previous round. Split – If the first two cards you’re dealt are of the same value, you have the option of splitting them to create two separate hands, which requires an additional wager equal to the value of your initial bet. You can draw as many cards as you like on each split hand, except when splitting aces. An ace and a ten value card on a new split hand is not considered a natural blackjack and will pay out like a normal 21 win. Insurance – If the dealer’s first card reveals an ace, you have the option of placing an additional wager of half the amount of your initial bet in order to insure your hand. If the dealer’s hand does result in a blackjack, you’ll receive a payout of 2 to 1 on your insurance bet. If the dealer does not have a blackjack, you’ll lose your initial bet plus your insurance bet. Double – If you think your initial hand is strong and are confident that a third card will allow you to beat the dealer, you can opt to double the amount of your original bet before being dealt your third card. 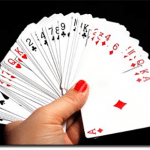 Seven Card Charlie – Although rare, it is theoretically possible for you to draw seven cards without exceeding 21. If you manage to do this, your hand is considered a Seven Card Charlie and you automatically win. If the dealer’s initial hand is valued at 16 or less, they will draw an additional card, but will stand with their initial two cards if the hand is valued at 17 or greater. Blackjack Surrender offers standard payouts where a winning hand will pay 1 to 1, insurance pays 2 to 1 and a natural blackjack pays 3 to 2. 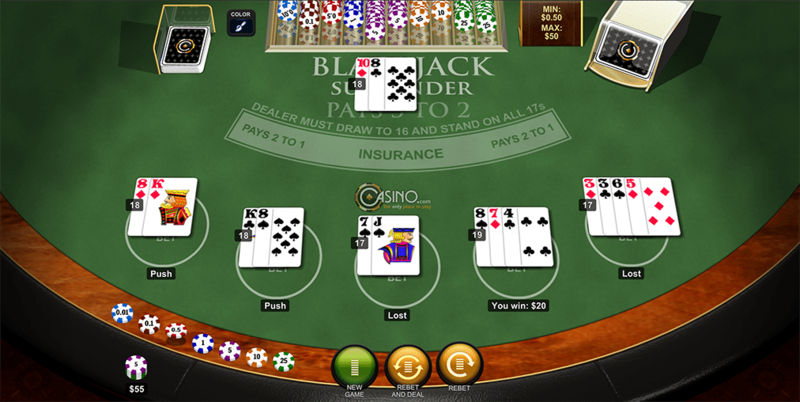 Blackjack Surrender is available at one of our top-rated 21 sites, Casino.com, where you can play directly over your Web browser or by downloading the exclusive Casino.com software (which is unfortunately only available for PC users). You’ll find a lot of great blackjack variants at this site, including some rarer titles like Blackjack Switch, 21 Duel Blackjack and Double Attack Blackjack. Casino.com happily accepts deposits in multiple currencies using safe depoit methods like Visa, MasterCard, Neteller, Skrill and Paysafecard. Sign up to play Blackjack Surrender at Casino.com and claim a new player welcome package that includes a 100% matched deposit bonus up to $400, giving you the chance to try more blackjack games for less risk to your bankroll.